- Choose a sunny area. - Protection from wind is important. - Select nectar plants for the butterflies and host plants for the caterpillars. - Choose hardy plants that grow in your growing zone. - Butterflies prefer to visit flowers with strong colors such as orange, yellow, and purple. - Color and shape are important but the fragrance of the flowers is also very important. - Butterflies prefer composites (daisy-like flowers), umbels (flowers that are flat topped and originate from a single apex), and panicles (large clusters of blossoms on a stem). Wildflowers and prairie grass can create a natural setting that will help attract butterflies to your area. Black-Eyed Susans and Purple Coneflowers are wildflowers that many species of butterflies are attracted to and they're easy to grow in many parts of the country. Wild varieties of goldenrods, milkweeds, phlox, yarrow and sunflowers are also very effective in attracting butterflies to a natural area. It's best to mix host plants so that the females can lay eggs in a natural setting while being able to enjoy the nectar of their favorite flowers. A small meadow in a suburban area can bring a touch of country and many butterflies. Successful butterfly gardening can be done on a small scale. Wildflowers can be planted in patio containers, pots or hanging baskets and displayed in various places, even an apartment balcony. Butterflies need shelter from the wind, rain and other elements. Providing a shelter for butterflies will help keep them in your garden as well as give them a place to roost at night. Shrub foliage will provide a wind break and also offers a spot for them to roost for the evening. There are some butterflies that will perch and roost in natural areas that are overgrown and have tall patches of grass. Overgrown areas resemble a butterflies natural habitat and will provide more protection from the elements. An alternative shelter for butterflies can be created by piling logs 3'-5' high in a cross-ways pattern. It is a good idea to cover the top of the pile with a tarp or roofing material to protect the butterflies from rain and then add a final layer of logs on top. The log pile should be placed in shade with nectar and host plants nearby to attract butterflies. This type of shelter will make a cozy sanctuary in which our fluttery friends can hibernate or roost. Butterfly Houses, for hibernation, can be built or purchased commercially. Mourning Cloak, Question Mark, Comma and Satyr Angelwing are butterflies that hibernate and search for suitable overwintering spots. Strips of bark or a similar material should be placed inside and always place the house in a shady location. Many butterflies obtain moisture, nutrients and minerals from moist areas around water. 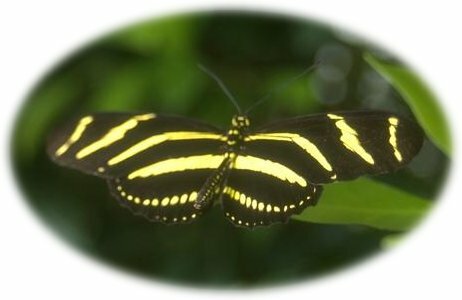 Natural or artificial streams and ponds are wonderful assets to a butterfly garden. Allow a damp area or shallow puddle to form in a garden to see if you can attract Tiger Swallowtails, Sulfurs, Skippers or Blues. By adding a little salt to the water from time to time you will help provide your mud-puddling butterflies with the sodium they need. Watch for mud-puddling to occur mid-day, during the warmest hours of the day, as butterflies gather around a puddle on the moist dirt or sand.